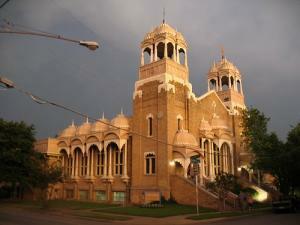 Originally housing the first school in ISKCON, this former church in Dallas, Texas has been converted to a traditional Vedic temple design. There are presently 25 temple-owned homes in the immediate neighborhood which have became models of community redevelopment. The Gurukula continues to provide education from elementary through junior high levels, and Kalachandji`s restaurant is ranked among the city`s best. 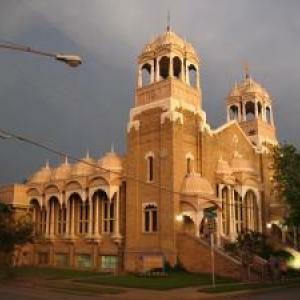 By the grace of Sri Sri Radha Kalachandji and Srila Prabhupada, the devotees of the Dallas Hare Krishna temple continue to maintain high standards of preaching and worship, as demonstrated by their enthusiastic Sunday Feast program. Please check website for more details and more regular events such as Bhagavad-gita classes and public chanting.